There it is, the oldest shop in Preston, on Cheapside, opposite the Harris. Gosh, it's like the Old Curiosity Shop! Take away the amusement arcade next door and I wouldn't be surprised to see a little match girl selling her wares from the doorway. Postively Dickensian! I read somewhere that there was a culverted river/stream that originated somewhere in the Avenham/city center area and emptied into the Ribble. Do any of our posters/historians know anything about this ? I went into the Harris to enquire about it but was told I would have to make an appointment to speak with a city historian, but it was toward the end of my vacation so i didn't have the time to do it. I have since e-mailed the Harris asking about this river but have received no answer as yet. Any locals know of its whereabouts and why it was culverted ? Does anyone remember the name of the toyshop in Preston Its on the tip of my tongue but I will reconize it if someone says the name. You had to go upstairs to the toy department. Thankyou Alan it was Merigold's the one I remember I shall be able to sleep tonight. The curiously small shop on Friargate/ Cheepside, opposite the Harris Libriary and Art Gallery used to be a tobacconist's they had a good range of Pipes, Petersons, Meerschams etc. the whole shop had a sweet aromatic tobacco aroma ,that shop and The House of Bewlay on the corner or Fishergate and Guildhall St, together with Woods next door to the Odeon/ Gaumont/ New Vic. 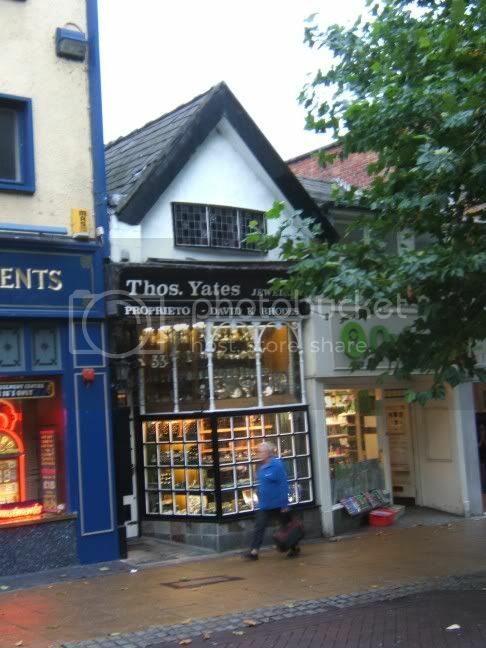 were 'the' tobacconists ,in Preston. I wonder if the man with the handcart/baking oven is still on Cheapside, selling hot potatoes ? I know that we are all anti-smoking now, but wasn`t it a nice smell when you went into a Tobacconists and took in the different aromas. What was nicer than the smell of cigar smoke at Christmas? Mentioning Mears and Merigolds brings back a lot of memories. At Christmas didn`t Mears put on a display of electric trains, I seem to recall going there and just looking. Happy days!! When I ask the family what the grandchildren want for Christmas I get the standard answer, send them a Voucher. I remember once putting a £10 note in an envelope for one grandchild, and on Christmas morning I went to see them, and daughter asked me what I was giving for Chrismas, mentioned Note and panic set in, bags of discarded wrapping paper was emptied onto the floor and searched. The note was found and a lesson learned on all sides. Big decision time now, will it be Argos, Early Learning, W.H.Smith or even Claires who provide them; or should it be an apple, an orange, a sugar pig, and a bar of Nestles Chocolate?? We had to make do with that sort of thing.